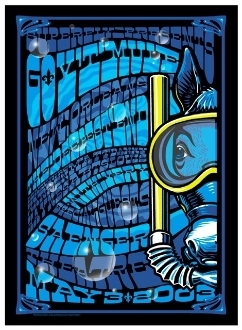 * Condition issue - (1.5) - AoMR 135.1 - Gov't Mule / New Orleans 2003. Screen print by Jeff Wood and Ralph Walters. Measures 22x30 and is in (1.5) good condition. There are a few creases and a couple of dings. Not mint-mint but will frame beatifully! Stamped on the back - DCS and #756/800. Ships ina 4 inch tube. (because of the 1.5 condition. this sale is final and non returnable.) I can send pictures if you are interested. It's 99% perfect - with a few dings.